This list of Best Fiction Authors in the Denver Area was a complete surprise to me. It's dated 8 December, but I didn't know about it until two weeks later when a 'google alert' came in. (Don't know if this was on the television or not.) I'm the third one on the list. A thrill of a lifetime!!!!! I'm utterly thrilled and humbled to announce that A Land Beyond Ravens has won the Colorado Book Award for historical fiction! YAYYYYYYYYYYYYYYY!!!! Reviews have hailed the book as “one of the most historically realistic Arthurian novels ever written, a thoroughly mature work...” The book tells the story of a spy and master of disguise in fifth century Britain who, while being squeezed between the politics of two powerful kings, accidentally sparks off what becomes the quest for the holy grail. “Twenty years ago today, I adopted Colorado as my home, and now I feel like Colorado has adopted me back,” Guler said in her acceptance speech. She then read a brief passage from her book. The prestigious Colorado Book Award is sponsored by Colorado Humanities’ Center for the Book, established as the state-based affiliate of the National Endowment for the Humanities. A Land Beyond Ravens, as well as the other books in the Macsen's Treasure Series, are available by order from any bookshop or online at amazon.com. It is also available in ebook format at Smashwords.com: http://www.smashwords.com/books/view/15861. Shhh! Don't tell anyone. This is one of the places where Marcus ap Iorwerth in Into the Path of Gods exchanges messages from the secret alliance that will attempt to depose the old high king Vortigern and replace him with Ambrosius, the man they believe to the not only the rightful high king, but who will also be a much better leader. The link below leads to a photo of Castell y Gwynt, which is a volcanic formation that pushed up between the two peaks, Glyder Fawr and Glyder Fach in Snowdonia, North Wales. 1. 14-16 May 2010. All shortlisted books for the Colorado Book Awards, including my historical novel, A Land Beyond Ravens, will be featured in a Book Fair at the LoDo (downtown) Denver Barnes & Noble store, 16th & Curtis Streets, Denver, CO. I will be there on Friday, 14 May between 3pm and 5pm to sign books and answer questions. 2. 16 June 2010. The sponsors of the Colorado Book Awards are also featuring a series of readings for the finalists. I will be reading from A Land Beyond Ravens on Wednesday, 16 June between 5pm and 7pm. The readings take place at Baur's Ristorante, 1512 Curtis St, Denver, CO.
Bring friends, family, colleagues and celebrate with the finalists! 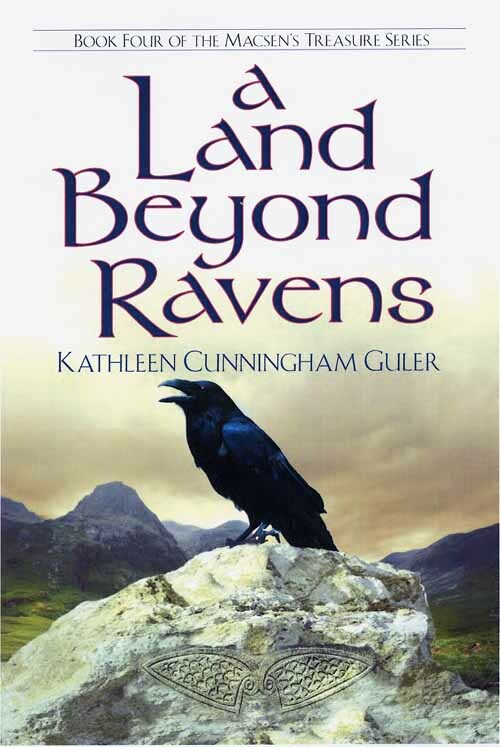 A Land Beyond Ravens has been shortlisted in the Historical Fiction category of the 2010 Colorado Book Awards! This is the most prestigious statewide award in Colorado, where I live. Woo-hoo!!!! Prior to the Awards ceremony, I'll be joining other finalists for books signings and readings throughout the state, including a book fair at the downtown Denver Barnes & Noble, May 14-16. More info on this soon. Final results of the Awards will be given Friday, June 25 in Aspen during the Aspen Summer Words Literary Festival. Fingers crossed for luck! Another award for A Land Beyond Ravens! Woo-hoo! A Land Beyond Ravens took 2nd place Fiction at CIPA (Colorado Independent Publishers Association) Book Awards banquet Saturday night! The novel has been nominated for several more awards--should hear more starting in April. While moving along with the re-edit (which is turning out to be more like an overhaul) of my first book, Into the Path of Gods, I decided to reassess one of the secrets my main character Marcus discovered. Ok, actually, he stole it from the druids. We know very little about the druids. Mostly, it’s some skewed, propagandized information left from the Romans who destroyed the druid enclaves in Britain as part of their conquest of the island. Because they banned all forms of writing, the druids left behind no documentation of their own. They were, however, considered well educated for the time and along with the histories, mythologies and genealogies of their people, they may have also understood some astronomy and other scientific disciplines. When the Romans destroyed their groves, schools and culture, this vast knowledge was lost. Or was it? It is believed that a few druids escaped the annihilation and continued to practice in secret. One reason for banning the written word may (and that’s a big ‘may’) have been to protect their knowledge. Were some of their secrets dangerous? Something they didn’t want people to use on each other? In the original version of the book master spy Marcus ap Iorwerth stole one of those secrets. He reproduced a recipe of charcoal, saltpetre and sulphur, an explosive powder he enclosed inside fragile clay balls and lobbed over fortifications to make noisy distractions and wreak general havoc. Anyone in the know would recognize this recipe as what we call gunpowder. Having no guns in the fifth century, Marcus called his weapon a powder ball. Historians believe gunpowder, invented by the Chinese, was not known outside of China until the thirteenth century, although the Chinese possibly knew it as early as the tenth century. Could the druids have actually known or figured out how to make gunpowder? It’s possible, but we’ll never know without a time machine. So if the druids (and Marcus) didn’t have this explosive powder, to what else could they have had access? In doing a little research, I learned that accounts of incendiary weapons have been documented as far back as the ninth century BC and have encompassed a wide variety of formulas, delivery systems and names in the centuries ever since. The most common name applied to the entire range is ‘Greek fire,’ invented by the Byzantines. This term actually only originated since the Crusades and in truth should apply just to the particular mixture the Byzantines employed. Other names, some from earlier times, some from later on, include sea-fire, Roman-fire, war-fire, liquid-fire, prepared-fire, automatic-fire, and processed-fire. Because druids belonged to Celtic culture that goes back to ca. 500 BC, and because it was widespread across much of Europe and even into parts of western Asia in those days, it is possible the druids could have known of this form of weaponry and kept the formula secret. Indeed, throughout the centuries these formulas were heavily guarded military secrets. Now, I’m not a chemist or scientist, so I’m hoping this makes sense. Of the substances used in these formulas, a petroleum-like fluid, ala tar, pitch, naphtha, or tallow would have created the base. Other ingredients might have included sulphur, saltpetre (aka stone salt), charcoal, and quicklime. Marcus would have had access to tar (distilled wood, peat moss, heath, among other sources), as well as stone salt, charcoal and quicklime. Here’s one of those instances that makes me love research. Quicklime, when in contact with water, immediately increases in temperature to 150° C. So if a pile of wood is soaked with tar in combination with some of these other substances, and quicklime is added to it, it’s possible to start the fire with water of all things! This liquefied fire was delivered by various means, often out of pressurized siphons—primitive flame throwers. 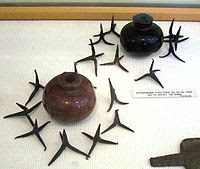 Another innovation in delivery of this fire is shown in a picture from the National Historical Museum in Athens: clay grenades! These were used in the 10th – 12th centuries, and were filled with Greek fire. In the picture they look like they are made of glazed ceramic. Other pictures show them made of unglazed terracotta. This seems to partially validate Marcus’s use of clay spheres to deliver his destructive message. Clever fellow that he is, he could have improvised this delivery system as good as other innovators did. Just because it’s not recorded somewhere, especially in a time when things were rarely or not recorded at all, doesn’t mean it couldn’t have existed then. So, we have Marcus stealing the recipe to produce liquefied fire, making up or stealing the idea for some device to deliver the goods, but what would he call it? As he’s discovering this for the first time, he might overhear a term from the druids or dub it something logical as he sees it. Of the names listed above, perhaps war fire or liquid fire might make sense. Because he intensely dislikes the sea, he’d never call it “sea-fire.” He might be tempted to call it a “river-fire” instead because it looks like a flaming stream or river. But when he first sees it, a loud boom is set off. I think he would call it “thunder-fire.” Maybe by the time the editing is done I’ll have decided on another name. Or Marcus, in his clever, convincing way, will have decided it for me.